I have made this tart before several times with normal red tomatoes, so when a gorgeous tub of mixed tomatoes turned up in the veg box I thought this would be the perfect recipe to show them off. Unfortunately the picture doesn’t quite do the beautiful colours justice as it was quite dark when I took it. The base is filo pastry then you heat up some olive oil with a small amount of fennel seeds, cumin seeds, ground coriander, sliced spring onions and garlic. Just heat the sliced tomatoes through in the oil with the spices and onions. 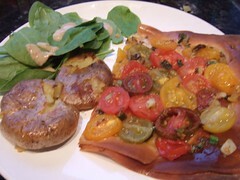 Layer the tomatoes on top of the pastry and bake for about 12 minutes. Drizzle any remaining oil over the tart and serve. I had a few of my favourite potato squashers with it and it was light, fresh, colourful and perfect for summer! I won’t be cooking much I can blog about over the next few weeks. Earlier this week I was honoured to be selected to test recipes for Isa Chandra Moskowitz’s forthcoming brunch book, “Crack of Noon”. She’s asked us not to publish pictures yet. I’ve already tested 4 recipes and I can promise you it’s going to be wonderful! I’ve got a few things I cooked a while ago and didn’t get round to blogging, so I’ll probably use a few of those to keep my hand in!